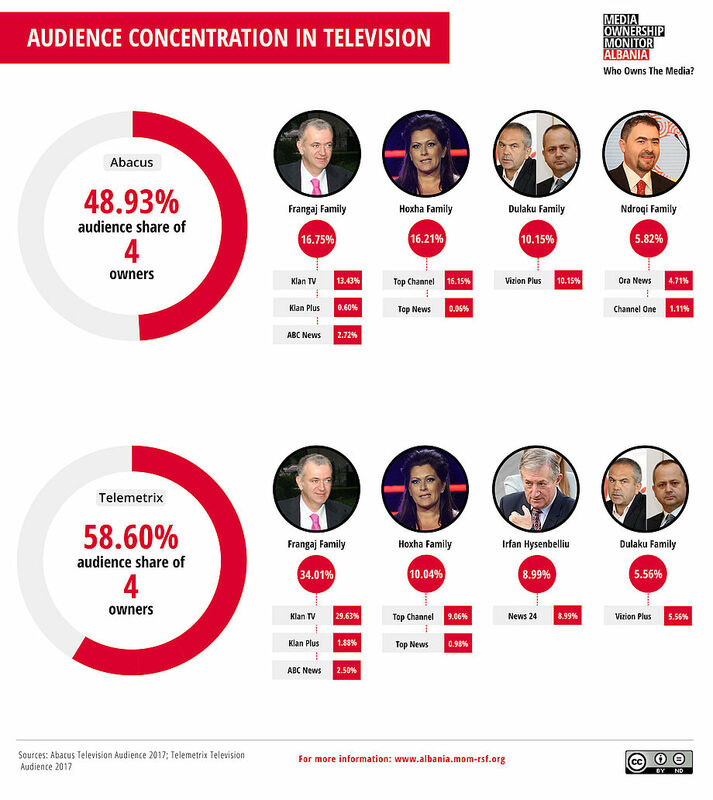 Despite its many shortcomings, for many years researchers perceived the Albanian media as vigorous and fairly diverse – mainly due to the large number of outlets competing in a small market. However, the new data on audience and market concentration probed by the MOM team, suggests that the perception of plurality is an illusion, as audience and revenues remain concentrated in the hands of a few, family owned groups, which dominate the media market. Although there is a lack of reliable data, the MOM shows a high audience concentration in TV and Radio. In the print market, one major owner (Irfan Hysenbelliu) controls single handedly 30.22% of the readership, while the four largest owners (Irfan Hysenbelliu, Koço Kokëdhima, Henri Çili and the Dabulla Borthers) control 43.29% combined. Ownership across the different sectors – TV, print and radio – in Albania is also rated high. The analysis of market shares for TV and Print, provide even more evidence of concentration. The four biggest owners in the commercial free-to-air TV market are the Hoxha Family with Top Media, the Frangaj Family with Klan Media, the Dulaku Family with Media Vizion and Irfan Hysenbelliu with News 24. The two major owners in this segment alone, the Hoxha and the Frangaj family, have a combined market share of 71.7%.